At a campaign rally in southern Illinois Saturday evening, President Donald Trump condemned the “evil, Anti-Semitic attack” Saturday morning on a synagogue in Pittsburgh as an “assault on humanity,” calling on Americans to come together while also calling for the suspected shooter to receive the death penalty. 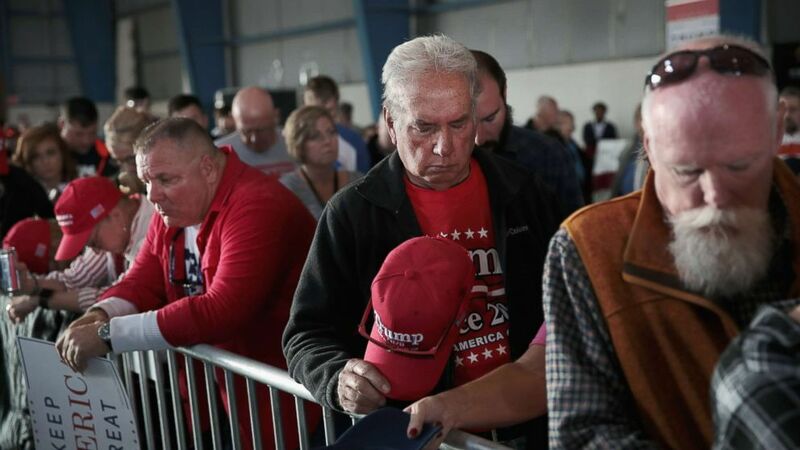 “They have to pay the ultimate price,” Trump said in his remarks at a campaign rally in Murphysboro, Illinois with several local House GOP representatives, Reps. Mike Bost, Randy Hultgren, and Rodney Davis. “We have to draw a line in the sand and say very strong never again,” Trump said. First responders run with a person on a stretcher at the scene where multiple people were shot, Oct. 27, 2018, at the Tree of Life Congregation in Pittsburgh’s Squirrel Hill neighborhood. The choice for every American this November is between resistance and results. If you don’t want to say the words, ‘ladies and gentleman, Speaker Nancy Pelosi,’ vote Republican. He explained his decision by citing the late New York Yankees’ owner and friend George Steinbrenner and his resolve for the Yankees to play after the September 11th attacks in 2001. He also claimed that the US Stock Exchange remained open, though it was closed for six days after the attacks. Trump’s rally — one of a flurry of stops planned before the midterm elections — was held in a congressional district carried by President Barack Obama in 2008 and 2012. Law enforcement officers secure the scene where multiple people were shot, Oct. 27, 2018, at the Tree of Life Congregation in Pittsburgh’s Squirrel Hill neighborhood. Given that history and GOP Gov. Bruce Rauner’s unpopularity in the state, Democrats see the area as one of several possible pick-up opportunities that could help them flip at least 23 sears and win control of the House. Brendan Kelly, Bost’s Democratic opponent, would be a “vote for Nancy Pelosi, and of course Maxine Waters,” he said. You’re going to be so happy next week. You’re going to see something happen next week. Trump also praised Bost, and said Bost would support protection of pre-existing conditions for health insurance, even though the congressman voted for the GOP health care replacement plan, which analysts said could have raised premiums for some consumers with pre-existing conditions. While Trump earlier told reporters he would “have a different tone tonight” after the synagogue attack — he also asked the crowd about his tone, prompting supporters to shout “no!” — he took a shot at conservative critic Bill Kristol and once again referred to Sen. Elizabeth Warren as “Pocahontas,” a jab at the DNA test she recently released on her Native American ancestry. Calling the midterms “the election of the caravan and Kavanaughs,” Trump hinted at additional administration action on immigration after mentioning the caravan of migrants traveling through Central America heading to the US-Mexico border. “You’re going to be so happy next week, you’re going to see something happen next week,” he said to cheers. It remains unclear to what exactly the president was referring.